Kit SMM001 available from Spacemonkey Models, $59.95 plus $9.95 USPS Priority Mail (U.S.). International Mail $15.95 (First Class parcel post). Impressive; relatively simple; high quality decals included; excellent research; includes reference DVD. A professional, quite decent initial foray into model kit production. It all began with an enigmatic email (“watch for a package”) from Austin (TX) friend, modeler and aviation/rocket aficionado, James Duffy, who, until now, has been “just” the honcho of rocket.aero, the local outfit that creates archival quality DVDs of esoteric aircraft and rocket subjects such as the B-58, BOMARC, Me-163 and F-107. 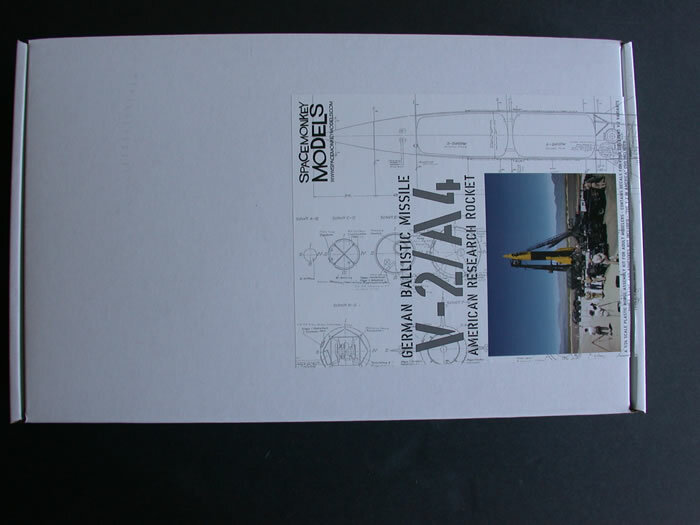 At 1/24 scale, the V-2 makes an impressive, if relatively simple, model. The rocket body proper is blow-molded (yes, just like the myriad lineup of product containers at your favorite supermarket, but this may be a first for display model kits) with injected fins, nose cones, vents, etc. 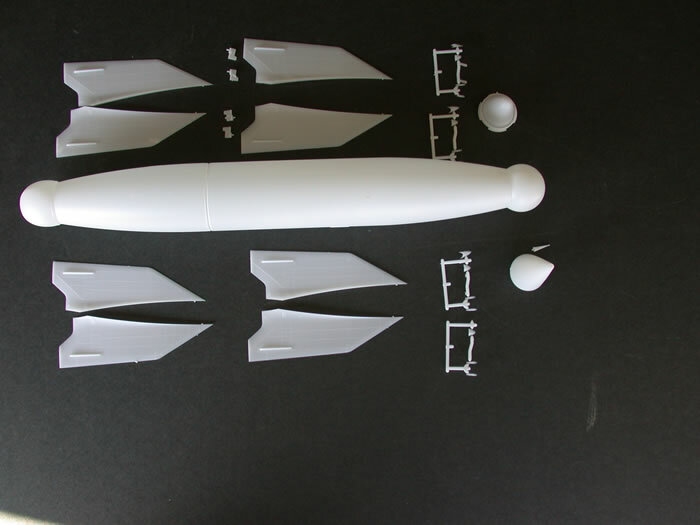 The one-piece rocket body and fins all have appropriate seams and panel delineation. 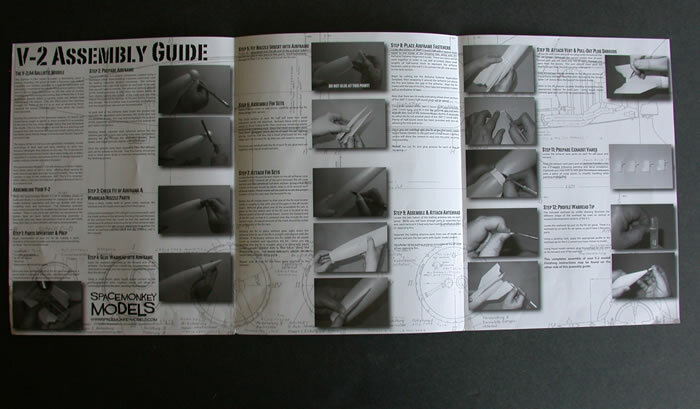 Orientation of 24 tiny fasteners (that the modeler gets to cut from supplied 1.5mm half-round stock and glue into a circumferential molded-in slot in the rocket body) is accomplished with a handy pre-printed paper strip that is cut out and taped around the rocket body. 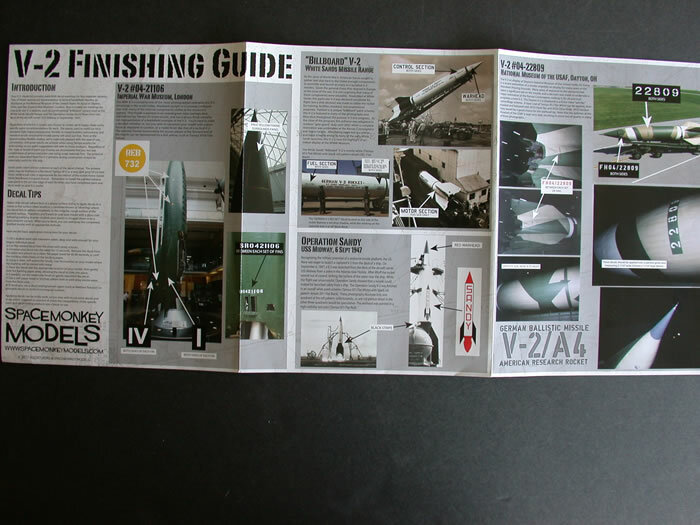 Four color schemes for American-used V-2s and decal locations for each are portrayed in a large glossy, color photo foldout; on the back are B&W pix of all assembly steps. The glossy decals are very complete, in perfect color register, with sharp resolution...and they’re thin! James is an ardent researcher of the subjects he addresses–his cover letter included in the kit says that he’s put ten years research into the V-2 and two years into producing the model. 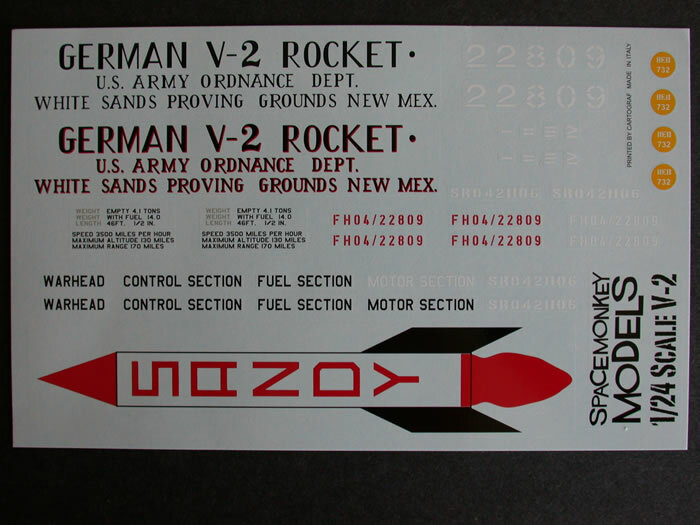 It should come as no surprise to anyone who has viewed a rocket.aero DVD that a significant value-add to this kit is the full color fold-out showing all four versions of the rocket as used by the U.S. post WWII and the wealth (265 minutes!) 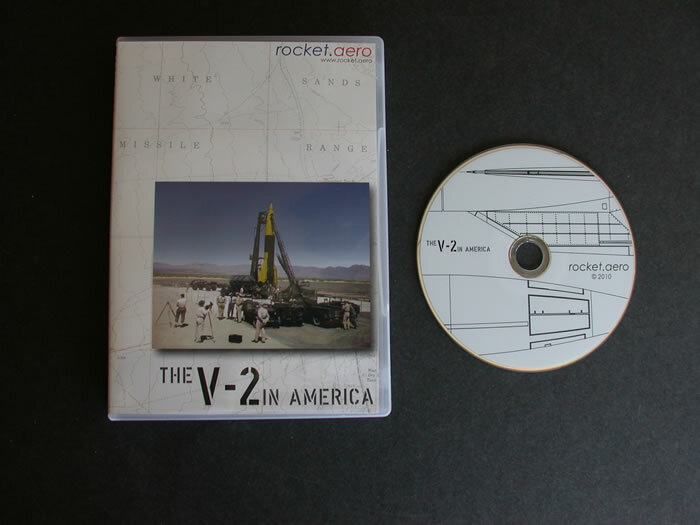 of archival data included on the accompanying DVD, “The V-2 in America”. “The V-2 in America” an original short film covering early years of V-2 research at White Sands. “Blossom” upper atmosphere research project. “Bumper” WAC flights (the first ever from the Cape Canaveral facility). V-2 assembly, testing and launches from Germany (Peenemunde). “The Cape”, a 1963 film of the early years at Cape Canaveral. “Laboratories Beyond the Sky”: V-2 flights at White Sands. “Operation Sandy” the Navy’s launch of a V-2 from the USS Midway. “Project Backfire”, a British film on the first V-2 research launch at Cuxhaven. A special “Modeler’s Notes” audio track. If V-2 kit sales go well, James advises, he’ll press into the second Spacemonkey project--I suspect he’s already started–the name of which I can’t reveal, but it’s an exciting and, fer sure, different one! My thanks to James for the review sample.